Apple’s iPod Shuffle is heavily criticized for its lack of a screen. While gadget junkies did not fall in love with its very basic feature set, it did have sales for one simple reason- cost. In this era of ever faster product cycles, and the planned obsolescence of our disposable society, who can argue with a $100 player with half a gig of storage. After all, there are many folks out there with less than 100 MP3’s, and this capacity player will more than serve their needs. Lexar has taken the old adage, “If you can’t beat ‘em, join ‘em” to heart. They have built a very basic MP3 player, but at least it has a screen to display the name of the song playing unlike iPod’s Shuffle. Sure, some folks will want a more full featured player. And Lexar will be happy to sell them their more featured players including the LDP-400, LDP-600, or the upcoming LDP-800 player. For their LDP-200 player they cut the feature set to the bone, and left off the FM radio, and a microphone. There is no included software. The unit is powered by a standard AAA battery to save the cost of a rechargeable cell. You can even buy the unit with no memory card included. The LDP-200 stores it songs on an SD card. This is another example how SD cards are dominating in this market segment. 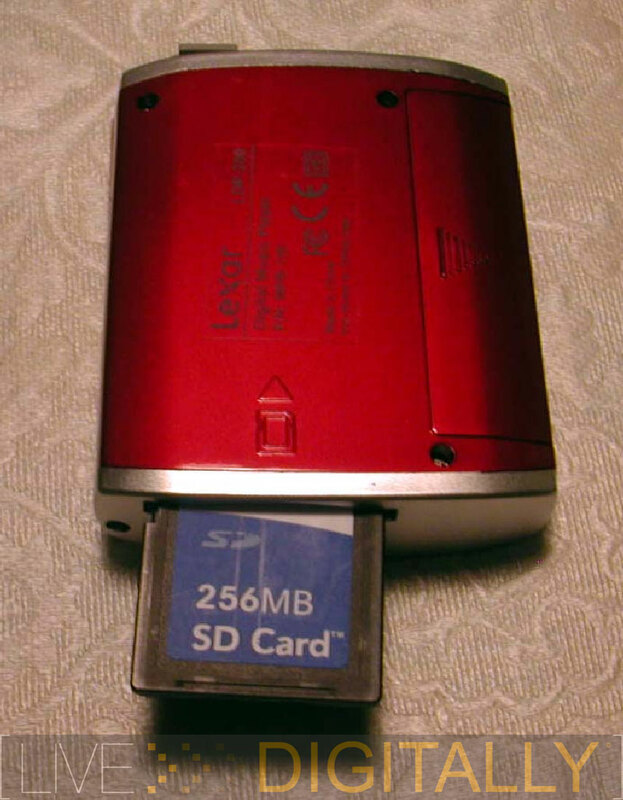 The unit can be purchased with no card included, or with included card capacities of 256 MB, 512 MB, or 1 GB. If you already have SD cards in your collection, the no card version becomes an affordable alternative at $49! Let’s take a look at the LDP-200 and decide if it’s “no frills” feature set gets the job done. I am curious to see if the device performs more on the side of frugal, or if it slips towards just plain cheap. Unlike in other players where the memory card expands the memory, here it is the only memory. The card fits into a slot on the side securely. There is no included case. The LDP-200 is entirely constructed out of plastic. One side features the headphone jack, the USB connection, and a small slot for the included lanyard. A cable plugs into the USB connection to interface with the computer’s USB port. There is no included software. This is not really a glaring omission, as Microsoft’s Window Media Player 10 is more than adequate. This is a free download for Windows users, and has a sync feature to put your tracks on the LDP-200. Windows Media Player can also rip songs into tracks of both the MP3, and WMA varieties. The LDP-200 can play both types of tracks, but in keeping with the no frills theme, doesn’t support any other file formats. 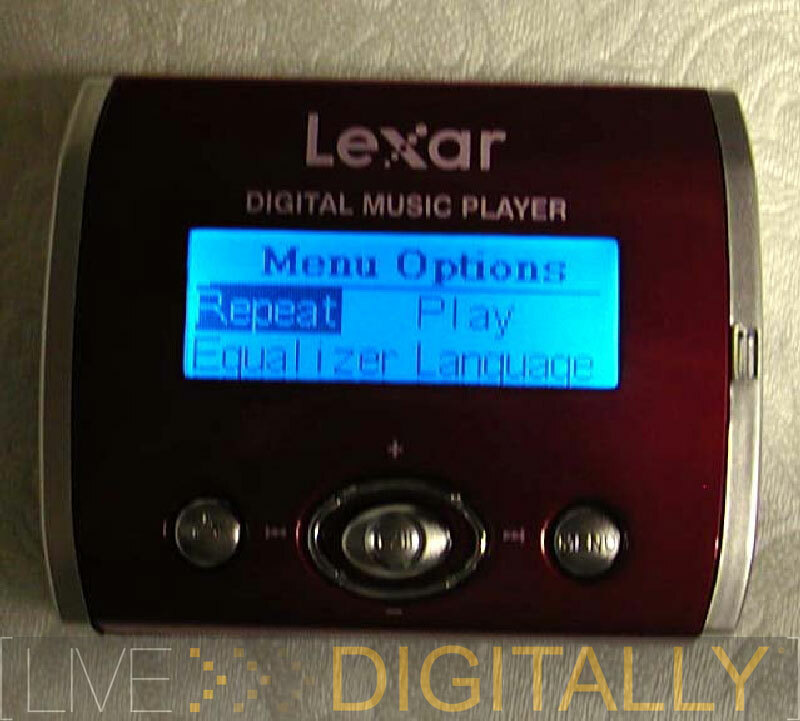 If you don’t like Windows Media Player, tracks can be simply dragged and dropped onto the Lexar device, and it will play them. There is no software needed as the player is just a “mass storage device” to Windows like your USB flash drive. It just happens to play its contents. In fact, like other players, it can function as an SD card USB 2.0 reader (sell that one to your boss when requesting this item on the expense account). The USB connection on the player is covered with a tethered port cover so it doesn’t get lost. 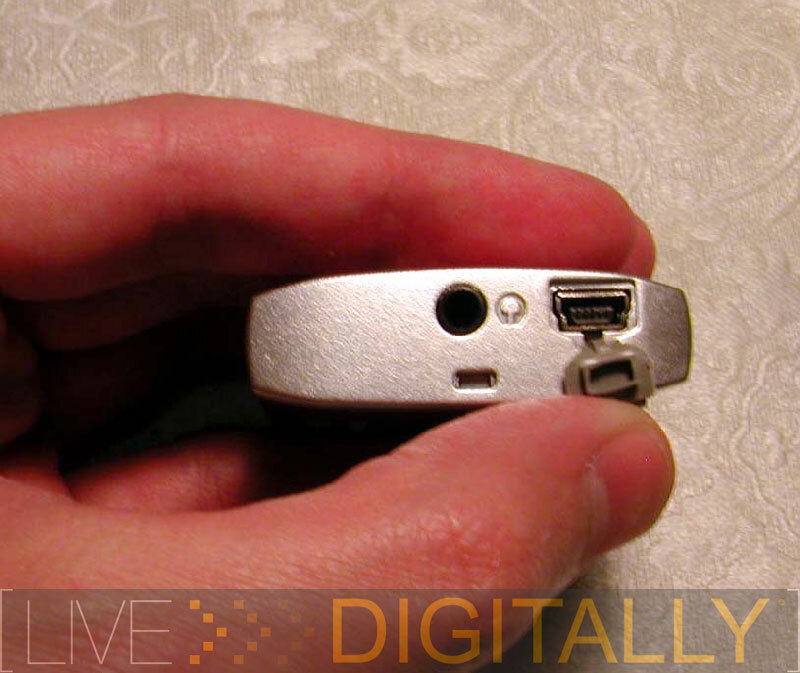 The other side features the SD card slot, and a hold button. The hold button locks all the player’s controls for vigorous activity. The SD card slot has a dust cover that closes when the memory card is removed. This is a nice feature that other players that use removable cards should adopt. However, as there is no internal memory, I doubt that the unit will sit without a memory card inserted for long. Notably absent are the album and artist information. In my opinion, they could have left out the bitrate info, and put the artist and album info instead. Even though the text is only 1 pixel wide, it is still readable, and large enough. The LDP-200, like other players, resets the volume to an acceptable level when the unit is rebooted. This is audiologist approved, but rather annoying, as in the car you need to have the volume all the way up when playing through the cassette adaptor. The Lexar LDP-200 is controlled by way of a 4 way toggle in the center, and two buttons, one of either side of it. The left button is for powering the unit on or off. The right button accesses the music folders with a short push, or the menu options with a long push. I had to read the manual to figure this one out, but once mastered was easy to do. If you have your music organized into folders you can limit play to one artist’s tracks. The center toggle is pushed up/down for volume control, and left/right for skipping tracks. When skipping tracks it is not too quick so if you are looking for a particular track it may take a while to find it. On the menu options screen, we can see that the next choices are repeat, equalizer, play, and language. I’ll detail each of these submenus below. The play options are three in number. Normal plays all the tracks in order. Intro (10s) plays the first 10 seconds of each track. Some CD players can do this, and it is useful when listening to a new CD. Shuffle plays the tracks in a random order. The equalizer is minimalistic as well. The five choices are normal, classical, rock, jazz and pop. There is no custom equalizer choice as on other players. I did not notice any difference with the equalizer set to normal, or to rock. There are also no bass boost or spatialization (3D surround) features. The languages include English, “Asia” and “Europe” to suit whatever continent you’re on. The play modes include normal, repeat1, and repeat all. While other electronics also have repeat once mode, I have always found it about as useful as sand in the Sahara desert. Unless you have a short term memory problem, I’m really bewildered why you would want to hear every song twice in a row. Just my two cents. Now back to the review…. The included headphones are an earbud design, but don’t go in the ear very much as with some in the ear designs. They don’t have a brand logo, but are labeled to indicate left and right. While these earbuds have no brand, they do reproduce the sound in an above average fashion. 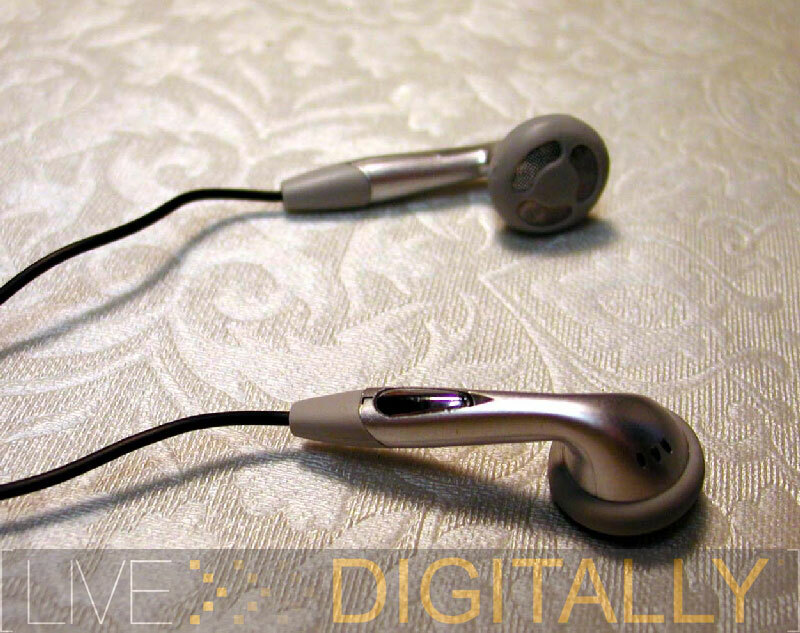 They don’t quite have the bass of the Lexar LDP-600’s included earbuds, they come quite close. Also, they don’t have any foam, rubber, or other attachments to fall off or wear out. Thankfully, they sound a lot better than their inexpensive appearance would suggest. While there are many separate headphone solutions out there, many users will use the included headphones with their music players. With a higher quality included solution such as these, you won’t need to upgrade nearly as much, especially for the nonaudiophiles. 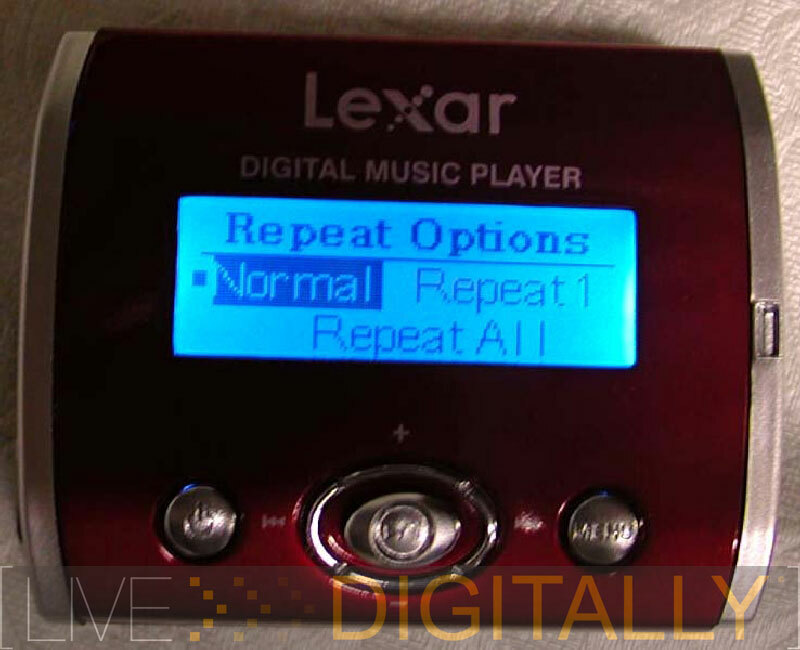 The Lexar LDP-200 was tested while listening through a variety of devices. I used it with an Altec-Lansing 4.1 speaker system, Sony headphones, the included headphones, and via a cassette adaptor through my 6 speaker, 180 watt car audio system. I listened to a variety of music including rock, classical, and soundtracks. While this is the most subjective part, I try to be as objective as possible by trying various combinations of speakers, tracks and players. The audio, through each of the devices was above average compared to other players I reviewed recently. Through the car audio system there seemed to be a little more noise than usual, but only a little. Through the Altec-Lansing setup (probably the most demanding test), the audio sounded bright and full across a variety of tracks. I ported the same tracks over to some other players to confirm this. Finally, throughout all the listening devices, the audio was mildly bass deficient, even with the equalizer set to rock. Overall, the deficiencies were least notable when using the included earbuds. By Lexar doing their homework, their matched earbuds are well suited to this player. Each of the tracks played without any issue. It handled all the MP3’s and WMA’s thrown into it including constant and variable bit rate tracks. It is nice to see that the manufacturers seem to have gotten past these bothersome issues consistently now which were far too common a few short years ago. One issue I need to note. Towards the end of the review, the player would shut off in response to any minor change in position. My review unit was not new, and had previously “made the rounds,” with other reviewers using it, as well as being shipped multiple times. Perhaps some previous abuse in shipping was responsible for this behavior. I would pick up the playing unit from the cupholder of the car, advance the track, and upon placing it back into the cupholder gently, the unit would be powered off. This happened with a new battery, and was consistent and repeatable with the battery cover in place. I was rather disappointed with this shortcoming, and caused me significant concern for overall longevity of the Lexar LDP-200 device. I attempted to document this unusual, and almost unbelievable, behavior in this short video. 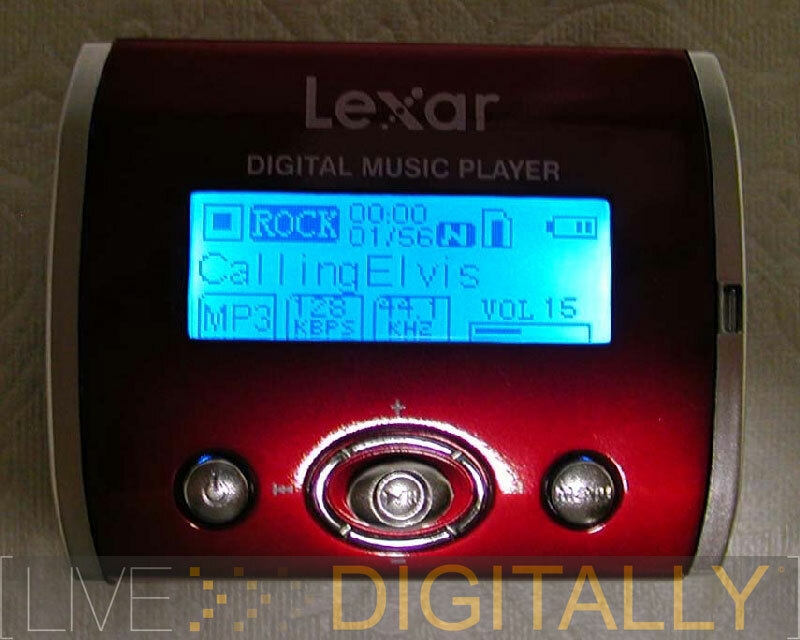 Lexar’s LDP-200 is well suited for the newbie who wishes to get into portable MP3 audio, without committing serious funds. College students with smaller music collections, and wishing to avoid being heart broken when they lose their Apple iPod Color which retails for $450 should look at this player. This unit is also ideal to give as a gift to a technologically challenged individual. If your intended recipient still has 12:00 flashing on their VCR, the Lexar’s simple interface is for this crowd. If simple gets the job done, than just go with it! The budget business traveler, who wants to listen to an occasional tune, and wants an affordable SD card reader, will be satisfied with their purchase. 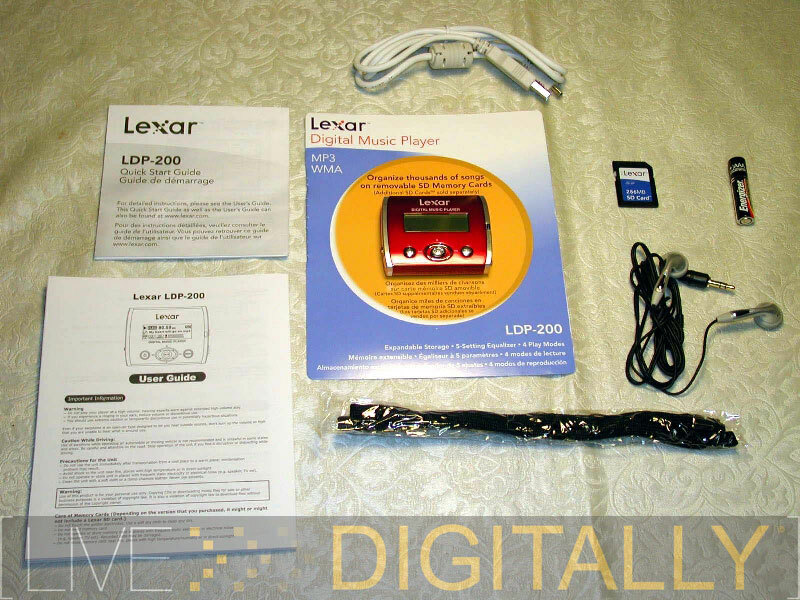 Overall, the Lexar LDP-200 player has one major thing going for it- price. For $49, plus the cost of a memory card, there really is nothing else out there. I’ve recently seen 1 GB memory cards on sale in the $60 range, so for just over one hundred bucks total, you can have a 1 GB MP3 player, with a screen. I don’t know of anything else with that kind of capacity in that low price range. The nice blue screen, included quality earbuds, and standard AAA battery power sweeten the deal. For a low price, I would be very willing to live without a carrying case, no included software, and limited equalizer options. I didn’t even miss a built in microphone, or FM radio. I can even live with only two supported music formats (MP3 and WMA) as these are the only two I really use anyway. Unfortunately, there are significant shortcomings. The spontaneous shut off has me concerned about the overall quality of Lexar’s unit. Also, the audio, on playback over quality speakers in the car or the Altec-Lansing setup, reveals a lack of bass and depth despite the equalizer. In short, unless I was very cash strapped, I would rather spend a few more dollars, and get a higher quality product. Lexar’s LDP-600, while more money, has a lot more features and offers significantly more “bang for the buck.” While the LDP-200 has great potential, it appears to end up on the cheap side of inexpensive. Buy the LDP-200 on Amazon today. Special thanks to Lexar for providing a unit for review. 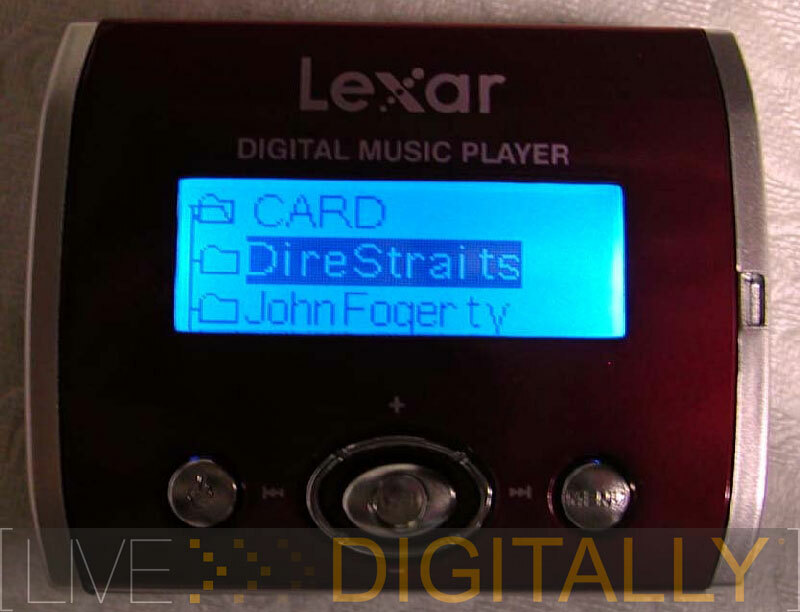 Had a chance to review the Lexar Jumpgear player? Or the Sandisk Cruzer Micro Companion? Both of which use USB 2.0 memory sticks. And maybe a little more flexible? We have not reviewed either player. If you click under reviews on MP3 players, you can see the stuff thus far reviewed. Stay tuned, a lot more reviews are planned. not quite accurate since the Rave-MP AMP256 is priced at $49 at Walmart and occasionally at $39 at Geeks.com and it has 256MB internal and a slot for a 512MB SD card. I own one and am very pleased with it’s performance over all. It doesn’t have a lot of bells and whistles, but it works and the price is right. Is it supposed to work with Janus DRM’d song? What’s the max size for the Memory card? 1GB? Wil it work with 2GB and up cards? 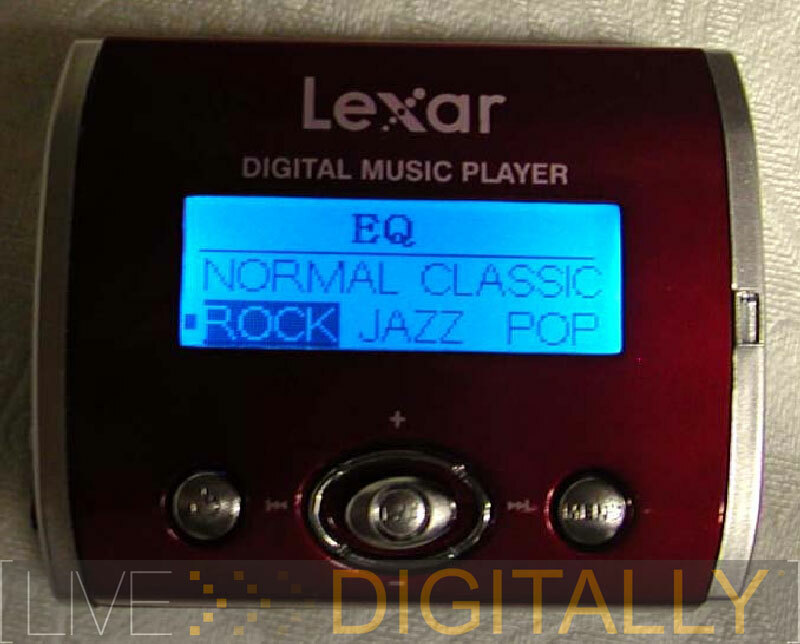 What is the headphone output rating in (mw) per channel on these Lexar units? What about joggability? I want something that’s inexpensive and can be worn when running/jumping/etc. Thank you all for your comments. I was not aware of the player at Wally Mart, it sounds like a great deal. 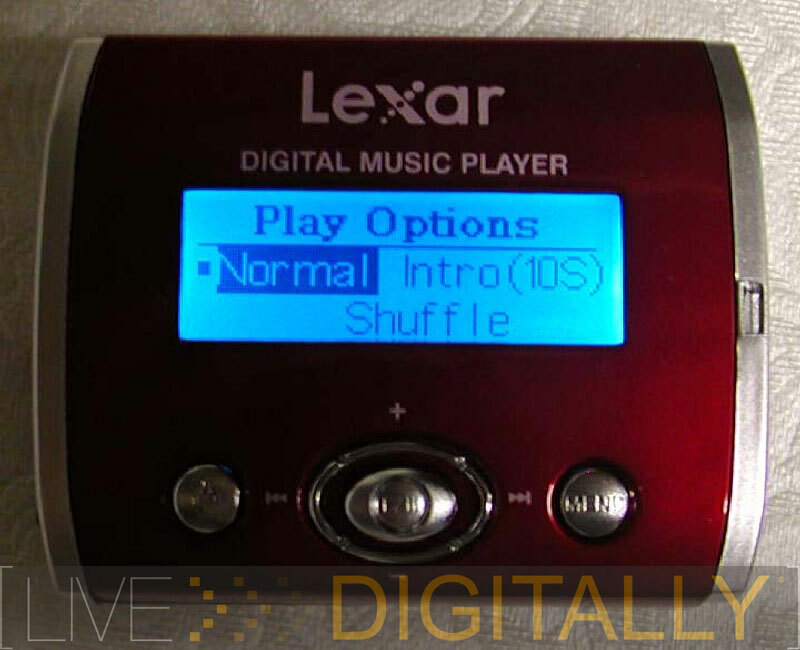 The iPod Shuffle was reviewed here a few months ago, and we couldn’t get passed the “no screen feature.” Lexar’s player will work with 2GB SD cards, and supports DRM WMA files. We have no idea what the mA rating of the headphones are, they were plenty loud. With the spontaneous shut off issue, I would look at the SanDisk Sansa for use in active lifestyles. While more money, it had no shut off issues. It’s supposed to work with Janus DRM, but it doesn’t work with the shipping firmware, and Lexar hasn’t released newer firmware. I really liked this review.. but my question is.. there are another devices with the ‘turn off’ problem?? Or that can be a isolated case? I’ll buy this because is smaller than Sansa by Sandisk. 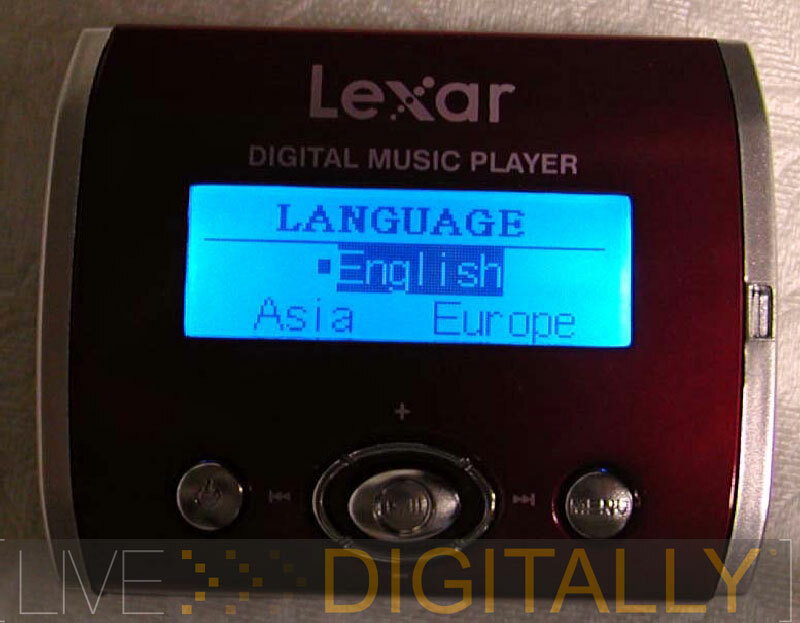 The Lexar Ldp-200 supports mp3 encoded with bitrate of 320Kbps? The LDP-200 does support MP3’s at the 320 bitrate. I only had one unit to test, so I have no idea of the prevalence of the “shut off problem.” In my series of one, it is 100%. Not sure if Lexar LDP 200 support SD cards with high speed. Does anyone know about it. Ricardo: No, that is nonsense (I know which review you are talking about). The SD card fits virtually all the way into the player, and protrudes at most only **2mm** from the edge of the device. Raj: What do you mean? Any SD card (including 2B) will work in the LDP-200. The LDP-200 is a USB 2.0 card reader, therefore it should also be able to take advantage of at least some of the high speed write capability of faster SD cards. The SD card protrudes about 1 mm out of the player. The player should be compatible with high speed cards, but I doubt there will be much benefit. I got mine… the bad news is that I lost the central buttom.. i consider that a poor control quality.. because that normally doesn’t happen with a better brand… no? Since I use mp3 for ripping and reading books on cd, I’m interested in whether it has a bookmark to return to when turning it back on. I just took delivery of one of these players and can confirm for the previous poster that it remembers the track being played before last shutdown, although it does not remember the particular time within that track at which playback stopped. Playback begins at the beginning of the last track being played. In my limited experience with audiobooks (just one), there are a number of track breaks on each disc, so this should lessen the issue of the player not remembering exactly where it left off. I’ve used mine for few months now. I am realy pleased with it. Got a $34 1GB card for it. Works great jogging or in car using cassette or FM adapter. I agree on the lack of bass, but the car stereo can atone for that. Only gripe I have is that the “Next Track” does not always respond, but that could just be “fat fingers”. I have not experienced it shut off unexpectely while playing. Nice unit for the price. I’m not sure about the sound quality issues; it’s no worse than my Sandisk Cruzer or Philips 3″ cd/mp3 players, but I haven’t compared it with iPods. Certainly it measures well – an analysis in Adobe Audition shows no droop in the bass at all (so it should be fine when used with stereos or powered speakers), though when cranked up with headphones the story might be different due to a cheap output amp. I loaded my 2GB SD card with music, popped it into the LDP-200, and it displayed the “No Files” error message. 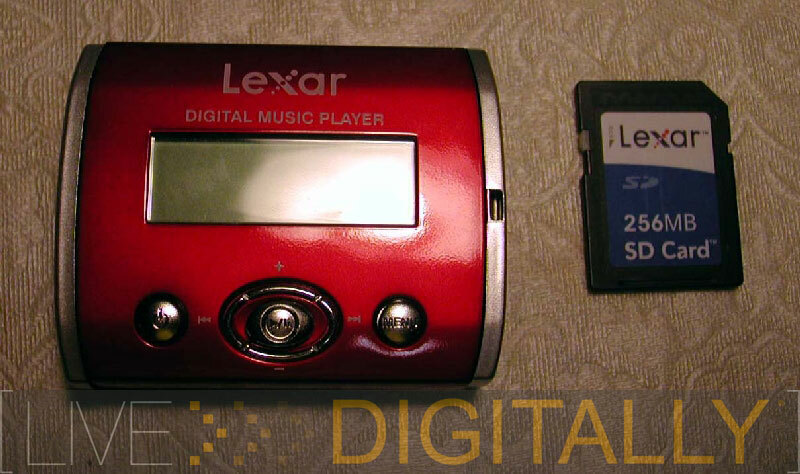 I contacted Lexar, and they stated that the LDP-200 has a 1GB limit. Rather than deleting CD folders from the SD card, I set the hidden attribute on a few folders and their files, and got the player to recognize the folders and files again. Anything beyond about 1.67GB and I get the “No Files” error message, although the limiting factor could be the number of folders or number of files rather than used space on the card. Just thought I’d mention this if anyone is considering using 2GB or 4GB cards with the LDP-200. In the future, I think I’ll stick with 1GB cards. Did anyone else experiment with fully loaded 2GB or 4GB SD cards on the LDP-200? If so, what was your experience? I have experienced the “No file” issue even with a 1GB card. It indeed seems to be related to the number of folders and their nesting. Too many nested folders seem to trigger this issue. The player seem to prefer one folder nesting, rather than the standard 2 folder nesting (artist/album). I have contacted Lexar to request a firmware upgrade to resolve this issue but who knows when or if that will ever happen. It has become a real pain as my music library is growing to constantly have to rearrange the folders. PS: I have experienced the weird shutdown at times as well, maybe once a week or so. I am also noting a problem with a undisclosed folder number limit. I have inquired with their support staff and have not heard anything back. Many people seem to be posting the same issue on various websites. Nobody seems to have gotten an official response from Lexar. Renaming directories to lower letters in the alphabet (such as naming the artist folder ABBA) seems to make that folders subdirectories/files viewable. This is a seriously limiting factor of the device. I can only play 1/3 of the music I have stored on my card. I would strongly encourage owners of the device to demand an official response until this limitation is documented. I would also encourage anyone who is interested in purchasing the device to confirm that this problem has been addressed before purchasing the unit. I have used this Lexar LDP-200 for about a month and am not happy with it. I have small fingers – so for the previous reviewer that thought that they had fat fingers – I don’t think that’s the problem. This player of mine will not toggle correctly – if at all. And the menu doesn’t work for me because it doesn’t toggle. I would advise anyone looking for an mp3 player to avoid this one. I think the toggle is too delicate for everyday use and you would waste your money. In theory it’s a good value. Cheap, small, simple. For the price you can forgive that it doesn’t include features like playlists, and doesn’t resume tracks where you left off. What is not forgivable are the MAJOR undisclosed limitations of the file management system programmed into the Version 0.5 firmware (the only known publicly available firmware version). With no playlist capability it’s critical to be able to sort music by folders. The problem is that the LDP-200 is only able to read 40 folders / directories regardless of how they are organized! The count begins with all folders in the root path of the SD card and then continues with the next level of subdirectories in alphabetical order and so on. So let’s say I sort my music by artist then album, if I have an average of two albums per artist and I cherry pick my tracks so that I only have an average of 3 songs for each album I can only play 76 songs. Worse yet if I’m storing photos or data in other directories on my SD card as Lexar says you can do, depending on how many folders I have dedicated to them I might not be able to browse/play ANY music at all! Furthermore even if I opted to place all media files in one folder the LDP-200 is limited to reading only 130 music files per folder. This is especially bothersome for someone who shelled out the extra cash for a high capacity card. I had to go back and forth with Lexar support for 2 weeks before I could get them to acknowledge this limitation exists, which they have still not documented publicly. They also stated that because they are not manufacturing the device anymore they may not do anything about it. This mentality towards product support has been the source of many recalls and class action suits for other similar products.